Kindness is a gift we can all afford to give, so make use of the various walls of kindness spread across Hyderabad to donate anything that might help those in need. 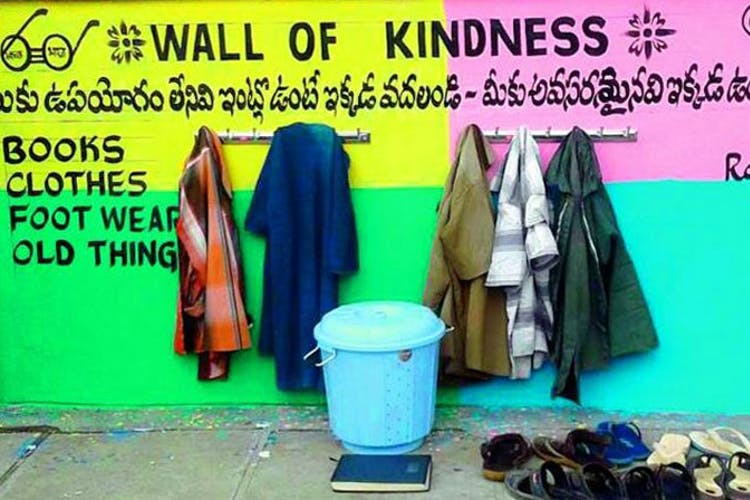 Wall Of Kindness is a concept that originated in Iran and has found its way to many Indian cities including Hyderabad. It is a charity and welfare phenomenon where you can leave clothes, books, shoes, blankets, utensils as well as food for the homeless and poor against a colourful wall. It sticks to the motto — ‘leave what you don’t need, and take what you do.’ Following the popularity of the first two Walls Of Kindness installed in Rajendra Nagar by the GHMC, there have been more such walls in areas like Amberpet and Musheerabad. Unfortunately, one of the walls in Rajendra Nagar has dilapidated due to lack of shelves, littering by stray dogs, urinating corners and people leaving unclean, torn clothes. But, there is still hope as the one in Amberpet is well-maintained while the Musheerabad wall has a shed and clean surroundings which ensure that the donations you make are not dampened by the rain or infected by dirt. You can also giveaway toys and pretty much anything that doesn’t benefit you anymore but you think will help someone else. Especially since it is Monsoon season, do try to leave behind umbrellas, footwear, and old raincoats by these walls. Although you can pick any of these walls, we’d recommend doing this good deed at the Musheerabad Wall Of Kindness or Hitech City one as they are well-maintained.